In 1987, the band R.E.M. released a song entitled, “It’s the End of the World as We Know It.” For those of us who were old enough to remember that song in the late ‘80’s (and subsequently released a few more times on “Best Of” and compilation albums), we get that catchy tune stuck in our heads and then finish the line, “and I feel fine…” (I apologize to all of you who now have the song permanently on repeat in your head). 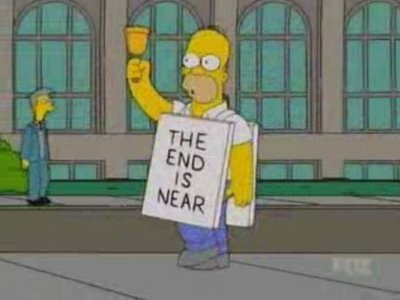 For some reason, that song has popped into my head any time I think of the claims of the doomsday “prophet” Harold Camping and his prophecy that the world will come to an end on May 21, 2011. I had seen the billboards and read news articles about Camping’s prediction, but I decided to go to his website and read his argument for myself a couple of weeks ago. I think the logic of his argument may leave you speechless, but not in a good way. Let me summarize. Camping claims that he can prove definitively that the flood (Genesis 6-9) occurred in 4990 B.C., although he does not offer that proof with his current claims. Then he uses 2 Peter 3:8 as a hermeneutical grid for the interpretation of God’s revelation and time. Peter writes, “But do not let this one fact escape your notice, beloved, that with the Lord one day is like a thousand years, and a thousand years like one day.” Based on a literal interpretation of that verse, Camping argues that God gave mankind 7,000 years to repent before the judgment based on the statement in Gen 7:4 that God told Noah the flood would start 7 days after he gathered the animals to the ark. Since Camping believes 7 days equals 7,000 years, we get to 2011. Next, he believes that the exact date of the crucifixion of Jesus was April 1, 33 A.D. He has calculated that there are 722,500 days between April 1, 33 and May 21, 2011 taking into account leap years, etc. Camping believes this is a significant number because you can multiply 5x10x17x5x10x17 to get 722,500. According to his numerology, 5 is the number of atonement or redemption, 10 is the number of completeness, and 17 is the number of heaven. Since these numbers ought to be doubled, or repeated, for significance (based on 2 Peter 3:8), then the multiplication sequence brings us to the number of days until the rapture. We must comment further about the incredible nature of this proof which is completely based on Biblical information. 1. April 1, 33 A.D. is the date God focuses our attention on, how Christ died to atone for our sins as Christ was crucified on that day. The number 5 also focuses on that day, inasmuch as it can spiritually signify the atonement. 2. Our salvation is entirely completed at the time believers receive their eternally alive resurrected bodies. This is what happens on the day of the Rapture, May 21, 2011. Thus the period of April 1, 33 A.D. to May 21, 2011 (inclusive) is the complete period from the time God shows us how our salvation was accomplished to the time our salvation has been entirely completed. This coincides perfectly with the number 10, which signifies completeness. 3. On May 21, 2011, the date of the Rapture, each and every saved person goes to Heaven because his salvation is altogether completed. The number 17 fits perfectly because it signifies Heaven when it has spiritual meaning. 4. The doubling of the numbers 5 x 10 x 17 like the doubling of the phrase “a day is as a thousand years” assures us that the truth of these proofs is established by God and will shortly come to pass. Isn’t it amazing that God uses this doubling principle to further guarantee that the date May 21, 2011 is absolutely certain, even as God has used it to absolutely assure us that Judgment Day is exactly 7,000 years after the flood of Noah’s day. Indeed, in the face of all of this incredible information, how can anyone dare to dispute with the Bible concerning the absolute truth that the beginning of the Day of Judgment together with the Rapture will occur on May 21, 2011. Thus, Camping and his followers reach the conclusion that May 21, 2011 is “the end of the world as we know it” (my apologies to R.E.M.). Of course similar predictions have been made before by Camping and others. Camping made similar predictions for 1988 (he claims on his website that the church age ended on May 21, 1988) and 1994. Similar predictions by other groups include the infamous prediction by William Miller that the rapture would occur on March 21, 1844. This failed prediction led to the founding of the Adventist Church. What are we to make of all this? I want to offer two thoughts. First, Scripture makes it clear that anything stated by a true prophet of God will indeed come true. If it does not come to pass, then we are not to fear (or respect) such a prophet. In Deuteronomy 18:22, we read, “When a prophet speaks in the name of the Lord, if the thing does not come about or come true, that is the thing which the Lord has not spoken. The prophet has spoken it presumptuously; you shall not be afraid of him.” We have seen these predictions before from Harold Camping and others. They claim to speak for the Lord with incontrovertible proof that God has revealed to them his plans. They have all been wrong about the end of the world. Camping lost credibility when his previous predictions failed, and Scripture clearly states that we are not to fear him. In fact, other so-called prophets in Scripture subsequently received the moniker “false prophet.” I believe the same holds true here. Second, Jesus made it perfectly clear that no one knows the day or time of his return. In Matthew 24:36, Jesus says, “But of that day and hour no one knows, not even the angels of heaven, not the Son, but the Father alone.” Earlier in that same discussion with his disciples, Jesus warns them against false prophets who will attempt to lead them astray (Matthew 24:4-5, 11, 23-26). Harold Camping claims to know what Jesus himself claims not to know. This is dangerous territory—territory that I will avoid at all costs. What should we do then? I believe we should heed the words of Jesus in Matthew 24:14 when he says, “This gospel of the kingdom shall be preached in the whole world as a testimony to all the nations, and then the end will come.” Let’s proclaim the gospel message to the ends of the earth, not for the purpose of ushering in the end of the world, but because we have been commissioned to do so (Matthew 28:19-20). If God wills, I plan to teach my class at church on May 22. We’ll be starting a new series on the life of Christ. We do not know what our lives will be like tomorrow for we are just a vapor (James 4:14-15). However, we do not fear the prophets who claim to speak for God yet do not exhibit the biblical evidence of being prophets. If the end of the world comes tomorrow, it has nothing to do with Camping’s “prophecy.” My guess is that we will be exercising this speculation again as we approach December 21, 2012—the supposed end of the Mayan calendar. Al Mohler offers some good analysis on this issue at http://www.albertmohler.com/2011/05/16/the-end-is-near-the-false-teaching-of-harold-camping/. No need to say sorry to R.E.M. All the radio stations keep playing the song in honor of tomorrow’s prediction. As always, well said my friend!